Chamaecyparis are a group of evergreen coniferous trees used widely in landscaping. 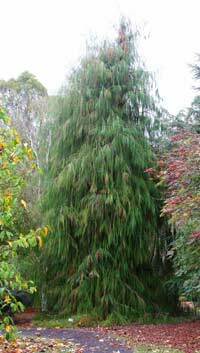 Popular species available for sale include : lawsoniana, nootkatensis, obtusa, pisifera and thyoides. All prefer a moist fertile soil and they seem at home in these conditions. Foliage varies in color between species and cultivars with a range from deep green through to yellow and blue. Landscaping uses vary, with some of the smaller growing species and cultivars being at home in rock gardens and when used as ground covers with some suited to growing in pots, troughs or sinks. Chamaecyparis obtusa cultivars seem well adapted to this end. Others are taller growing and have a more upright habit including many lawsonianna cultivars such as Ivonne (Yvonne) and upright plant with attractive yellow foliage which will reach around 2m depending on conditions. Other small growing cultivars include many of the pisifers cultivars, and again foliage varies from green though to attractive blues and yellows. In this group the cultivar 'boulevard' will get to 3m in around 15 years.